-Set up your square or rectangle shade sail anywhere you would like with Ollieroo Shade Sail Installation Hardware Kit. -The set are designed for durability and dependability, and comes with the essentials you need to safely and easily suspend your shade sail. -You can mount it between trees, wall to wall, wall to tree or wherever you want it. -The set is easy to use and will accommodate most kind of shade sail to set up your favorite relaxation spot with ease with this handy kit. -Turnbuckle - a stretching screw or bottle screw, a device for adjusting the tension or length of ropes, cables, tie rods and other tensioning systems. -Carabineer - a metal loop with a spring-loaded gate used to quickly and reversibly connect components. -Diamond Pad Eye - a holder often found on boat to run through a line and provide an attachment point. -Packing size: 9" x 7" x 2"
Note:100% Guaranteed Satisfaction and Replacement for Damage. 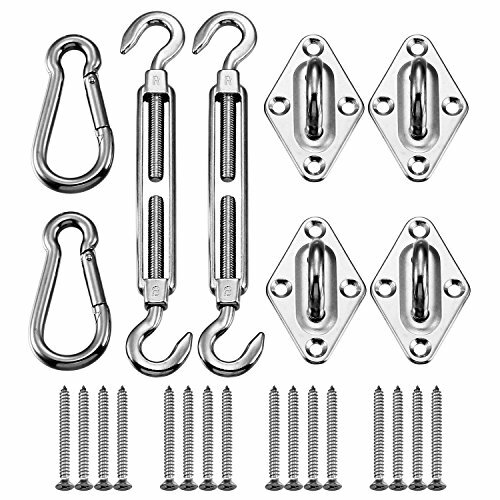 Easy to get money back if you unsatisfied with our Shade Sail Hardware Kit. That's because We wholeheartedly to provide you with a new shopping experience. Ollieroo wish you a happy shopping and happy every day! Made from High Quality 316 Stainless Steel; The set are designed for durability and dependability, and comes with the essentials you need to safely and easily suspend your shade sail. Includes 2 x Turnbuckle, 2 x Carbineer, 4 x Diamond Pad Eye ,16 x Matching screws(Shade sail not included). Adjustable turnbuckle to create tension, Length from 8" to 11". The set is easy to use and will accommodate most kind of shade sail to set up your favorite relaxation spot with ease with this handy kit.